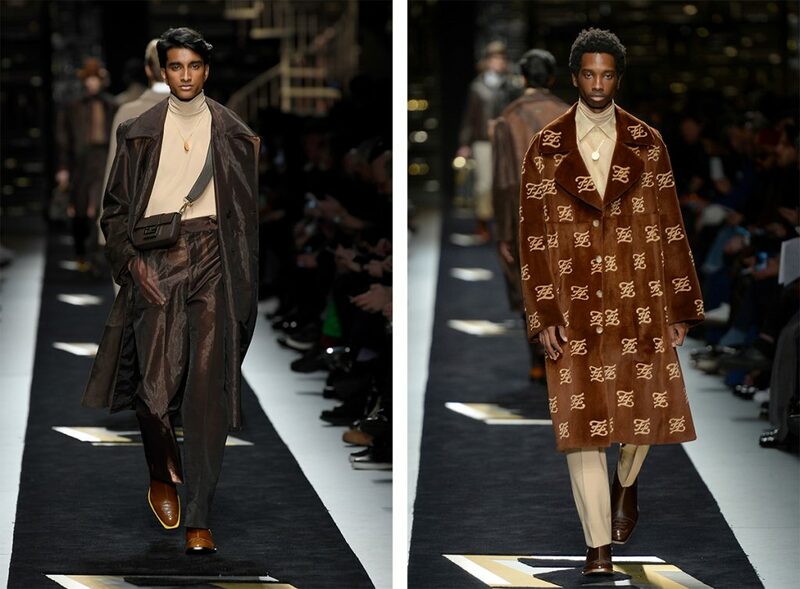 Acknowledging close to a lifetime of mentorship and mutual respect, the men’s fall/winter 2019 show saw Karl Lagerfeld’s integral artistic vision of Fendi as its main source of inspiration in a one-time, exclusive collaboration. 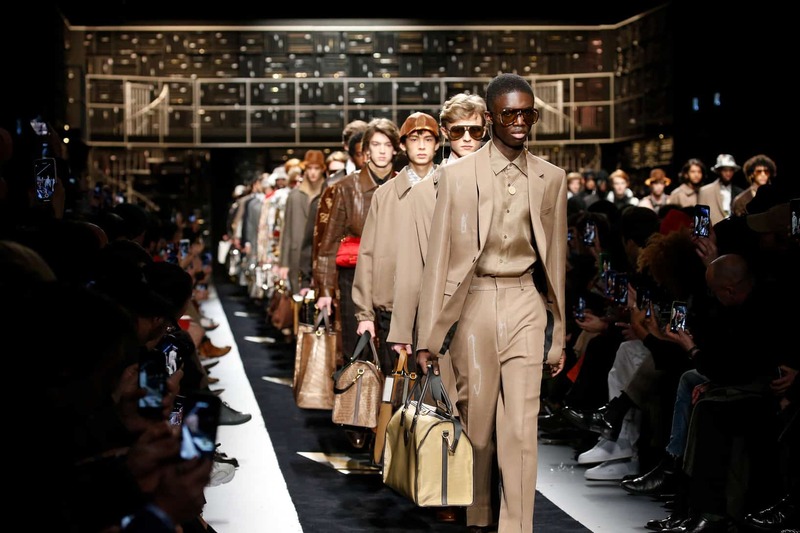 Lagerfeld’s potent aesthetic has shaped Fendi for over five decades and is applied to the brand’s menswear universe as co-designer (and subject) of the collection for the very first time. 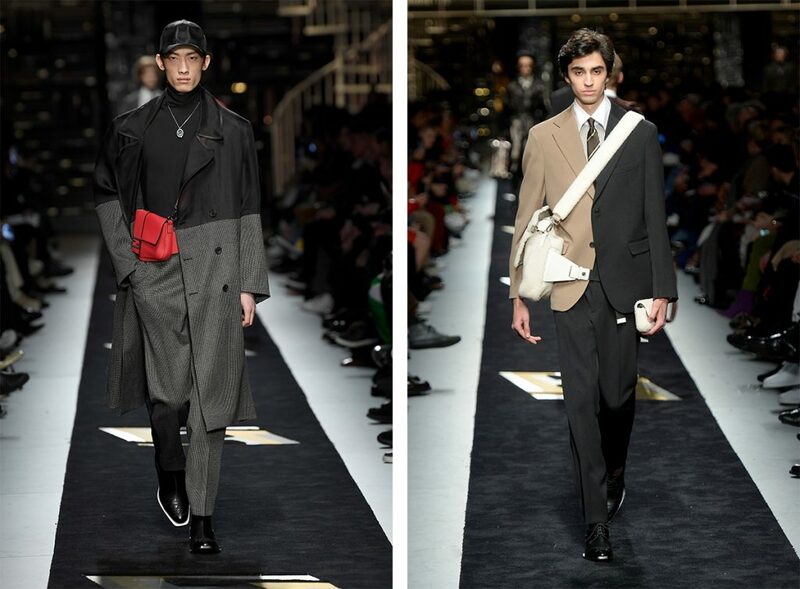 In collaboration with menswear creative director Silvia Venturini Fendi, Lagerfeld’s hand can be seen across the collection, from the rigorous cut of a tailored shoulder to the palette of sharp blacks and classic neutrals with a metallic sheen. Channelling a shared sense of humor, witty trompe l’oeil effects abound: zippers bifurcate sleeves, knits or coat backs, and silk organza poses lightness against leather and fur. From Lagerfeld’s original sketch, a unique asymmetric collar wraps from a shawl collar on the right, to a notch lapel on the left, accenting sharp blazers and overcoats. Elsewhere, his world springs to life in the Karl Collage: illustrated Fendi logos, hand-written letters and vintage photographs tell the story of the designer’s process through digital printed silks, shearling intarsia and sheer mesh luggage. 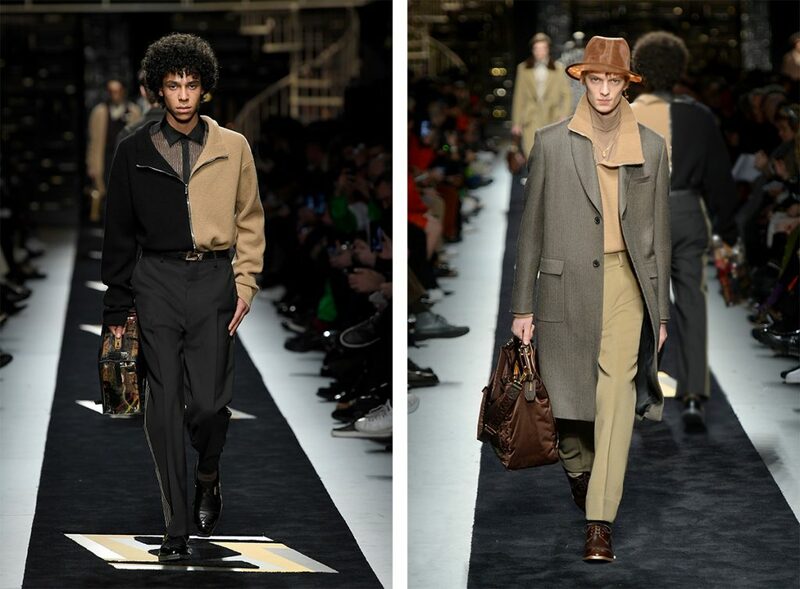 As for the rest of the collection, everything is dual: futurism and classicism swirl in a palette dominated by black, beige and brown, with accents of red and electric blue. Transparency and see-through give consistency to Fendi’s free-flowing lightness, playing with volumes and materials: the tuxedo is cut in organza, just like halves puffer parkas and intarsia fur pieces. A futuristic “FF” logo alternates with a calligraphic one, found also on accessories, from gold chains to chevalier rings. Shoes echo Lagerfeld’s signature, as the Cuban heels on cordovan or patent shoes. A functional traveller, the Fendi man brings his essentials around into cases, studded, foldable or defended by transparent covers turning into shoppers. Fendi’s legendary Baguette bag makes its debut for men: from mini to maxi, in precious croco or mink and Selleria leather, to be worn cross-body, hand-carried or as a belt bag.